I went to see Julie and Julia a couple weeks ago with my peeps. I loved it. I almost yelled when Amander Hesser (NY Times food writer and author of Cooking for Mr. Latte see blog post here) appeared on screen as herself! I also think you could create a drinking game where you take a drink every time butter appears or is mentioned. After the movie I started reading the book Julie and Julia. I know some people thought Julia's story in the movie was great but felt Julie's was weak, but I loved the Julie storyline too... because she is a blogger. I could relate to so much of her storyline. 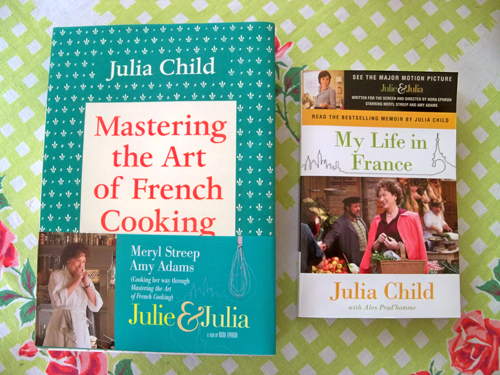 The book Julie & Julia definitely has less of Julia in it so I got My Life in France to read alongside. I really meant to look for a used version of Julia Chlld's infamous cookbook Mastering the Art of French Cooking, but everyone must have been thinking the same thing as me because I couldn't find it in the used bookstores. So I had to get a new version with the little movie ad wrap. Oh well! One of these days I will make something tasty from it! You should have a My Life in France party for your gal friends. That would be fine. I commented on your FB too about it. Totally forgot you read the Amanda Hesser book. Love her. Can't wait for her site. A Homemade Life by Molly Wizenberg (aka Orangette blogger) and The Tenth Muse: My Life in Food by Judith Jones (Julia Child's editor who is shown in the film). On a side note, I too enjoyed the protrayal of blogging in the film mainly because most movies never show realistic computer software or use and it's a huge relief to have it actually seem accurate! And, of course, blogging rules. I wouldn't call MTAOFC 'infamous'! That's a very negative word. That said, open ii up. Make a souffle. Make madeleines. Make floating islands. Make tournedos with mushroom and madeira sauce. Keep on going.